"Get your books and supplies with waiting for your financial aid refund (loans, grants and scholarships)!" Bookstore Dollars are charged to your Student Account and are applied against any credits you may have including financial aid, loans, and scholarships. Bookstore Dollars roll over from semester to semester and are continually available for use - they do not expire! By signing up for Bookstore Dollars, the student accepts responsibility of the charges placed on their Student Account. The charge cannot be removed once it is placed on the Student Account. 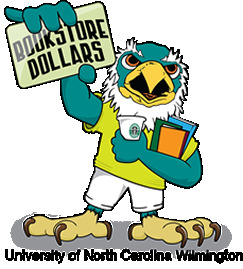 Bookstore Dollars may only be used at the UNCW Bookstore. It is recommended that financial aid recipients meet with their counselor prior to signing up for the Bookstore Dollars program to ensure they have enough funds to cover their anticipated charges. Get your books earlier. You can use funds at the UNCW Bookstore before the first day of class and before receiving a Financial Aid refund. Book charges can be included on your initial E-Bill. If you sign-up early, you can make just one payment to the university or you can include books in your monthly TealPay plan. Please remember E-Bill payment deadlines for your student account. Students may sign-up for Bookstore dollars until the drop/add date of the current semester. Log in to MySeaport with your UNCW email address and password. Select the Student Services tab at the top of the page. On the left-hand side under Service, select the Bookstore Dollars link. A new webpage will appear. Select the amount you wish to sign-up for from the drop-down menu, and select confirm. (Note: The amount of bookstore dollars available is the amount that you are allowed to sign-up for in the current semester. 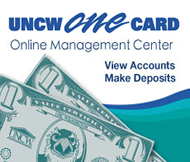 To view previous semester balances, go to the UNCW One Card Online Management Center). The terms and conditions page will appear. Select confirm if you approve the terms and conditions. Bookstore Dollars are available to use at the time of purchase. The balance is continually available for use until there is no remaining balance or the student leaves the university.